Henrikh Mkhitaryan and Mesut Ozil have won Arsenal’s February player and goal of the month awards for their impressive performances. Henrikh Mkhitaryan and Mesut Ozil have both won Arsenal awards for their performances in the month of February. 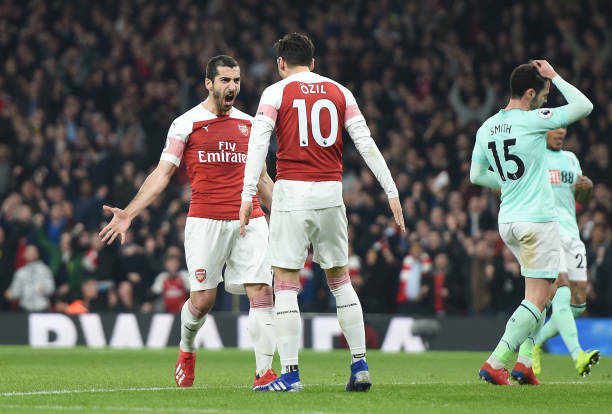 Henrikh Mkhitaryan after having been on the sidelines for two months returned when the gunners made a trip to Huddersfield Town’s home ground and the Armenian international was very impressive as the gunners won 2-1 even though he didn’t score or assist. Henrikh Mkhitaryan assisted Alexandre Lacazette’s goal against Southampton and also later went on the score sheet to seal Arsenal’s 2 nil win over the Saints. Mkhitaryan made two assists and scored one goal in Arsenal’s 5-1 win over Bournemouth a few weeks ago and the Arsenal fans are delighted that he is back on form at an important time of the season. Henrikh Mkhitaryan has beat Lacazette and Bernd Leno to become Arsenal’s February player of the month. The Armenian international received 40% of the votes and Lacazette came in second while Bernd Leno became third. Mesut Ozil did not take part in most matches that were played in January but he has got involved in some matches played in February and the German international scored vs Bournemouth using his trademark finish a few weeks back. 40% of the Arsenal fans voted Mesut Ozil’s goal and Henrikh Mkhitaryan came in second for his goal that was scored in the same match. So that’s it, Henrikh Mkhitaryan has become Arsenal’s February player of the month while Mesut Ozil’s strike vs Bournemouth won him the goal of the month award.